Even if your staircase isn't the focal point of your foyer, there are still a lot of things to consider when choosing staircase designs for your home -- and a lot of clever ways to utilize the space beneath your stairs too! Here, homeowners are talking about how to choose the best staircase style for your home, plus specific considerations you need to keep in mind before remodeling. Open staircase designs are one way to improve the floor plan of a home. So many builders and homeowners love the feel of the open floor plan and designing beautiful open staircases is a great way to make an architectural statement. Here are some tips for creating open stairs and a photo gallery of the different options you can choose. Installing handrails using composite materials has it’s advantages compared to wood. These DIY instructions tell you how to install them yourself from corner posts to rail caps. What’s hot and what’s not in what consumers want in homes in 2007? 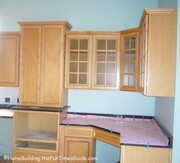 Which list do you think spiral staircases and glass upper doors on kitchen cabinets are on? You might be surprised. An interesting look at a curved staircase in a home in The Park at Anderson Farm in Marietta, Georgia. 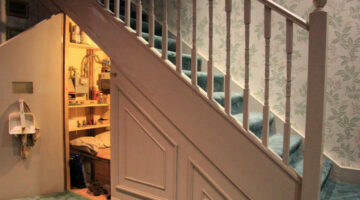 Staircase construction is a difficult process that is better left to the pros to conquer.